As goods, boxes, cartons, pallets and crates are moved or stored in the warehouse, there are times when a message is needed either to identify or instruct the user as to what the goods are or what action needs to be taken. 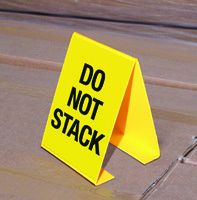 A message marker can provide a quick and easy solution. These high visibility yellow or white markers can be printed with your message or supplied plain for the use with a wet wipe pen. There are two types of marker; an L shape angled marker (MES1) that gives a message area on one surface, and a V shaped marker (MES2) that has a message area on two surfaces. 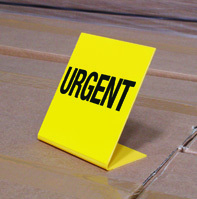 Both types of message marker have the option of being freestanding or having a self-adhesive or magnetic base. Both types of markers are sold in packs of five either blank or with identical black text.